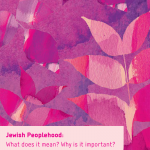 Looking back on an article she wrote almost a decade ago (“The Mitzvot of Peoplehood”) where she posed the question, “I’m a member of the Jewish People, so what should I do when I wake up in the morning?”, Wilf offers five potential avenues of action to nurture a sense of belonging to a Jewish people globally. These include: 1. Global Minyanim, which argues for creating opportunities for encounters with Jews from different countries, speaking different languages and of different backgrounds; 2. A global Jewish family genetic tree, which explores implications for the possibility that we are perhaps no more than a decade away from being able to map the entire Jewish people on one family tree; 3. Israel, which argues for circulating all Jews through Israel, regardless of where they live; 4. Hebrew, which promotes the idea that we should establish new and better ways of teaching and learning Hebrew as a Peoplehood Mitzvah; and 5. Recognition, which discusses ways in which we can continue to encourage and recognize new thinking and action on peoplehood.